We will use the existing Wireframes from assignment 09 and add graphics which have been produced as assignments throughout the quarter. Create a layout that has properly named Layers and is organized using Group folders. Using the existing Wireframe from assignment 09 add graphics and actual content. 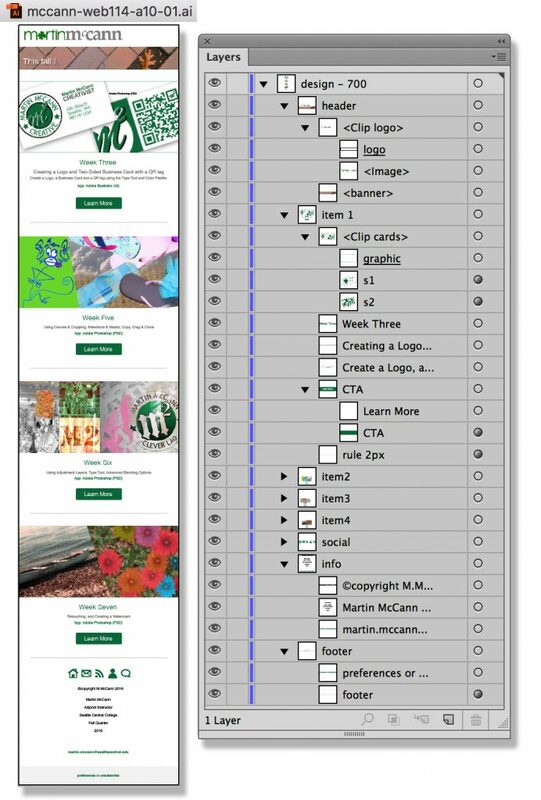 Establish all styles for major elements, CTAs, Text and graphic areas as necessary. All images need to be Embedded. When placing an image uncheck the “Link” option in the Place dialog box or after placing the image keep it selected and click on the “Embed” button on the Option bar. Week Three image is to show a cropped “business card” (side 2 optional) with a contrasting background and/or drop shadow to “define” the edge of the card(s). An image containing crop marks will not be accepted. Week Five, Six, and Seven images are to be positioned to entirely fill the allocated Graphic area of each listed Item. A Clipping Mask is to be made that will “clip” the excess image(s) from view. Proper and consistent spacing is to be used between content elements to insure ease in readability and interactivity with text links. Each content element ( h1, h2, body), should be created separately using a Text box. Fonts used are to be different then those used in the wireframe. Myriad Pro is not to be used. The same Font is to be used consistently and the styles are to be constant in size, color, alignment etc. throughout. H1 = 30px , H2 = 18px, content = 16px with 24px line height. Social icons are to have a consistent size and spacing and have a color fill that matches the color style established in the layout. Icons will not be accepted if left with the default black fill, even if black is used elsewhere in the design. *XC* Completion of 320px view based on assignment 09 wireframe. Using the existing elements from the 700px version developed in assignment 10, properly resize graphics and content to create the mobile layout.